Smage leaves Kansas with two more wins! 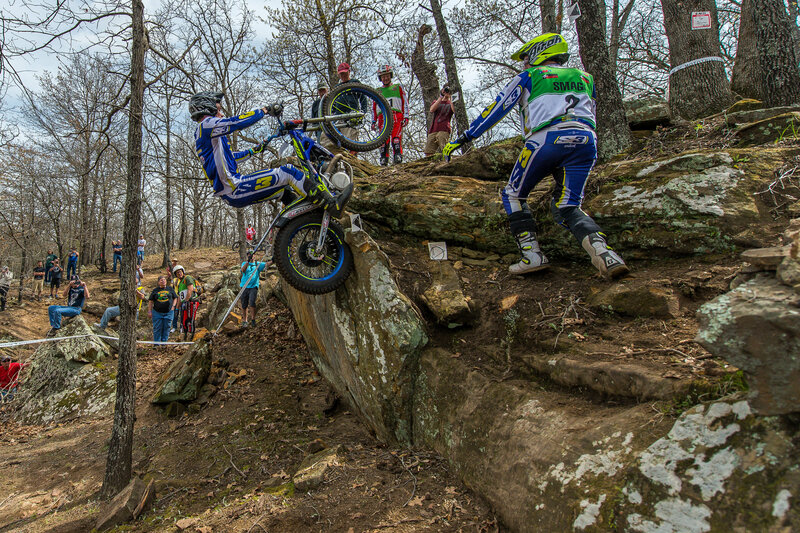 Sherco USA’s Pat Smage took a pair of wins at rounds three and four of the SWM US National MotoTrials Series in Sedan, Kansas this weekend, extending his lead in the championship standings to 14 points over Spaniard Marc Freixa, who was second on both days. The Kansas event featured technical sections with massive sandstone ledges, which the riders were sent up, down and around. Though the event was a bit tougher than last week’s event in Texas, it was still a relatively low-scoring trial for the top riders. Smage was steady and precise on Saturday, needing just two single dabs to navigate the entire 12-section, three-lap event. His first dab came in section five of the first lap when he got off his line and got too close to the edge of a drop off, forcing him to take a dab to correct his line. After that, the Wisconsin rider proceeded to clean the rest of the event until the final section of the day, where he took a dab on the take off to the massive wall at the exit. Smage’s one on 12 gave him two points total for the day, which was more than enough to claim his second win of the series. “I’m pretty happy with how I rode, and although the sections were more technical than last week, I was still able to keep my mistakes to a minimum and turn in a low score,” said Smage. Freixa ended the day in second, the Montesa USA rider finishing with a total of nine points. Freixa kept Smage honest for most of the day, taking two points on each of the first two laps, however, any chance to catch Smage for the win went out the window on the final lap when the Freixa ran his front wheel out of the boundary in section seven for a five. “Smage rode very well and I just made too many mistakes,” said Freixa. Factory Gas Gas rider Bryan Roper finished third with 16 points to claim his first podium of the season. Roper got off to a great start, taking just one point in the first five sections, but a two in section six, a one in seven and a five in section nine left him with a total of nine on his first lap. The Arizona native whittled down his score to a total of five for lap two – a three in section six, and a one each in sections eight and 12 – before really turning up the heat on the final lap with a total of just two points, both coming in the final section. Sherco USA’s Andrew Putt was fourth after turning in loop scores of 13, 2 and 5 for a total of 20. Meanwhile, Scorpa USA’s Karl Davis Jr. rounded out the top five with a total of 28 points. Sunday’s event was much tighter between Smage and Freixa. Smage took the initial lead when Freixa took a dab in section seven on the massive exit wall. This turned out to be a controversial section because the riders decided not to ride it the way it was originally set up, which included a 12-foot vertical wall. The markers were eventually moved over to a shorter section of the wall (only eight feet! ), which wound up being more manageable. Smage cleaned section seven on his first pass, but took a one on his second trip through. He also took a dab in the loose rocks at the bottom of section 10, giving the Sherco rider two points to Freixa’s one heading into the final lap. Smage managed to clean the entire final lap, and Freixa got through the tricky wall in section seven clean, but then took a dab in section 10 on the final lap in almost the same spot that Smage dabbed on the first lap. Both riders finished the trial with a total of two points, but since Freixa took a point before Smage did (in section seven of the first lap), the win was awarded to Smage. Roper and Putt once again battled over third place, with Putt getting the final step of the podium this time with a total of 10 points, including an impressive clean final lap. Roper admitted to being off his game on Sunday and finished fourth with a total of 19 points, while Karl Davis Jr. was fifth with 31 points. After four rounds, Smage now leads the SWM US National MotoTrials Series standings with a total of 115 points. Freixa sits in second place with 101 points, while Putt is third with 85 points. Roper sits fourth at 75 followed by Davis in fifth with factory Gas Gas rider Alex Niederer in fifth with 60. The SWM US National MotoTrials Series resumes action on June 17-18 in Cleveland, Ohio. For more information go to www.mototrials.com.